LAFAYETTE, LOUISIANA, UNITED STATES, April 3, 2019 /EINPresswire.com/ -- Lafayette, Louisiana, March 25, 2019 – Marshall University’s Alumni Association will present David Allie, MD, founder of the Louisiana Cardiovascular & Limb Salvage Center in Lafayette, with its highest honor at the organization’s 82nd Alumni Awards Dinner on Saturday, April 13 in Huntington, WV. Dr. Allie will receive the Distinguished Alumni award, which recognizes outstanding national achievements of Marshall alumni in their particular field. A member of the class of 1975, Dr. Allie was a four-year letterman on the Marshall baseball team, playing third base and short stop. His aspirations to play baseball professionally were cut short due to a shoulder injury, but resulted in an opportunity that changed his life. Dr. Allie is currently also nominated for the Marshall University Athletic Hall of Fame. Dr. Allie was the second recipient of the Marshall University’s Cam Henderson award, which provided one senior athlete showing athletic and academic excellence with a one year scholarship for continuing their education. Receiving this award provided Dr. Allie with both the economic means and confidence needed to pursue a medical education. After taking every class needed to apply to the West Virginia University Medical School in a single year, he was named first alternate, and granted admission when another student left after day one. Dr. Allie was the first medical school student in the country accepted with a Physical Education (PE) undergraduate degree. His medical career then took him to Louisiana in the 1980s, where, as a classically trained cardiothoracic and vascular surgeon, he was an early founding member of the Cardiovascular Institute of the South which grew into one of the five largest cardiovascular practices in the nation. His leadership also contributed to the launch of the revolutionary New Cardiovascular Horizons multidisciplinary medical conference which is about to celebrate its 20th anniversary. 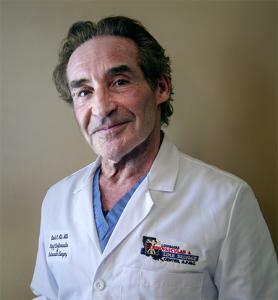 Dr. Allie has been lauded by numerous medical organizations and received Lifetime Achievement Awards from the Save a Leg Save a Life Foundation and the Superbones Society. As an award-winning physician, Dr. Allie was named the Cardiothoracic and Vascular Surgeon of the Year in 2000 and holds a number of clinical firsts in the field. During his distinguished career he has trained more than 2,000 physicians, performed hundreds of lectures and presentations on the field and written more than 250 articles, editorials and papers in educational journals. Most recently, he co-founded the Louisiana CLI & Limb Salvage Club, a non-profit, CLI education-focused organization. In almost 40 years of medical practice, Dr. Allie has been credited with performing over 10,000 major cardiac, vascular and general surgery procedures, over 12,000 non-surgical endovascular CV procedures (stents – balloons – laser – etc.) and provided over 300,000 hospital and office patient visits. In 2009, Dr. Allie opened the Louisiana Cardiovascular & Limb Salvage Center, to dedicate his career to patients with critical limb ischemia (CLI). CLI patients are at high risk for amputation due to the lack of blood flow to the extremities. The multidisciplinary center’s mission is to avoid amputation by restoring blood flow and addressing underlying conditions such as diabetes, infection and obesity. Earlier this year, Dr. Allie established the Albert Emmit Allie Scholarship, in honor of his father. This scholarship was created for future medical students from West Virginia attending Marshall University Joan C. Edwards School of Medicine. First preference will be given to a student from Logan County, West Virginia. Second preference will be given to a West Virginia resident. The award is renewable for three additional years, pending normal academic progress. He chose to honor his father because of the opportunities that he created for both Dr. Allie, and Dr. Allie’s son, Adam, to become physicians. Next year, Dr. Allie plans to create a similar endowment in memory of his mother, Joyce Nadine Smith Allie, who passed away in 2013. Dr. Allie’s youngest son, David Vincent Allie, is preparing to apply to medical school in 2020. Later this year, Dr. Allie plans to unveil the opening of a new 39,000 square feet, one of a kind medical facility housing under one outpatient (OP) roof, his large office practice, an OP Cardiac Cath Lab, An Acute Surgery Center (ASC) and a comprehensive wound care center providing hyperbaric oxygen (HBO) therapy, all integral in providing advanced CV and limb salvage care. For more information about the Marshall University Alumni Association’s banquet can be found here. Louisiana Cardiovascular & Limb Salvage Center specializes in endovascular revascularization, Vascular Surgery, and Cardiovascular Disease treatments all associated with CV disease and limb salvage. It was founded in 2009 by well-known cardiothoracic and vascular surgeon David Allie, MD, who was then joined by Raghotham Patlola, MD, interventional cardiologist. For more information, visit: www.cardiolimbsalvage.com. For more information, call (337)703-0646, email info@limbsalvageclub.com or visit www.limbsalvageclub.com.